Oh, I love my hobby so much! It's absolutely fantastic to get the chance to taste some samples of Whisky that's not widely available in The Netherlands. 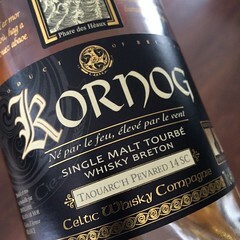 The French Whisky Kornog, produced by the Glann Ar Mor Distillery, is a great example. This peated Whisky is not made in big batches and as far as I know there's no current distributor in The Netherlands. 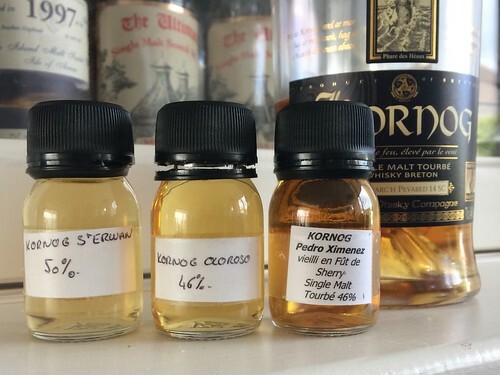 I was very pleased when Martine Donnay told me she would send me some samples of this years' bottlings. When I visited the distillery last year I already tasted a few Kornog expressions. The 2014 Bourbon Cask, the 2014 St. Erwan and the 2014 St. Ivy (cask strength) and of course the 2014 Sauterne Cask matured Kornog. I ended up buying one and I still enjoy it very much. Two of today's samples are matured on Sherry casks. Kornog Oloroso and Kornog Pedro Ximinez. I like Sherry matured Whisky's very much so I'm very curious how this peated (35-40ppm in the barley) spirit is influenced by the wood. The third sample is last years' St Erwan. Each year Jean Donnay selects the "best cask of the year" and bottles it at an ABV of 50%. That should be great as well. Let's see if it's as good as I remember. First in line is the Kornog Oloroso. As all Kornog (and Glann Ar Mor) bottlings this is a NAS bottling. Let's see if Jean Donnay has done a good job in selecting the casks for this bottling. The golden colour shows the youth of the spirit. On the nose there's peat (of course) but I get some fruitiness as well. Sweetness followed by a little bit of winey sourness. I don't get the typical dried fruits and chocolate sensation as I'm used to in other Oloroso matured Whisky's. The taste is fruity and a bit young as well. The peat is there but it's not overwhelming. There is a very nice balance between the peat and the fruitiness of the spirit. It's in the finish that I find just a hint of the Oloroso cask. A dark roast coffee sensation that lasts. A lovely spirit but in my honest opinion it should have had more time in the casks to give it the true Oloroso character. Let's see how the Kornog Pedro Ximinez performs. The colour is a bit darker, a bit like old gold. Maybe that's an indication for a longer maturation than the Oloroso cask. This nose is very different from the Oloroso nose. Again fruitiness that was also present in the Glann Ar Mor samples I described last week. Not much peat here surpisingly. It's there but just in the background. I get a hint of liquorice and I like that in a Whisky. A smooth taste, just a friendly hint of peat combined with a little bit of liquorice here as well. I like this one better than the Oloroso matured version but again I would like to see what a longer maturation period would do with this spirit. I like the finish as well. The peat is present there but I miss the typical Sherry influence in the Whisky. There's quality in both spirits that's for sure but they're both too young to really be "Oloroso" or "Pedro Ximinez". Time to taste last years' St. Erwan. The best Kornog cask in the warehouse. It's a Single cask bottling, matured on a Bourbon cask and bottled at 50%ABV. It has a pale golden colour. Great nose! Sweet honey and tropical fruits. Coconut and banana in a nice combination with the peated barley. The higher ABV doesn't make this Whisky agressive. A smooth, fruity taste with peat in the background. There is a long peated finish with hints of the tropical fruits and honey in it as well. I'm absolutely sure this is the best sample Martine send me. Next month the new St. Erwan will be bottled. I'll put it on my wishlist! Again a quality line up from my French friends at Glann Ar Mor Distillery. Be sure to taste either Glann Ar Mor or Kornog when visiting a Whisky festival or better yet, visit the distillery!